Most people do not fully grasp the implications of exponential growth. Federico presents us with some examples to help illustrate it. Figure 1.1: Top left, it begins with 1 grain. 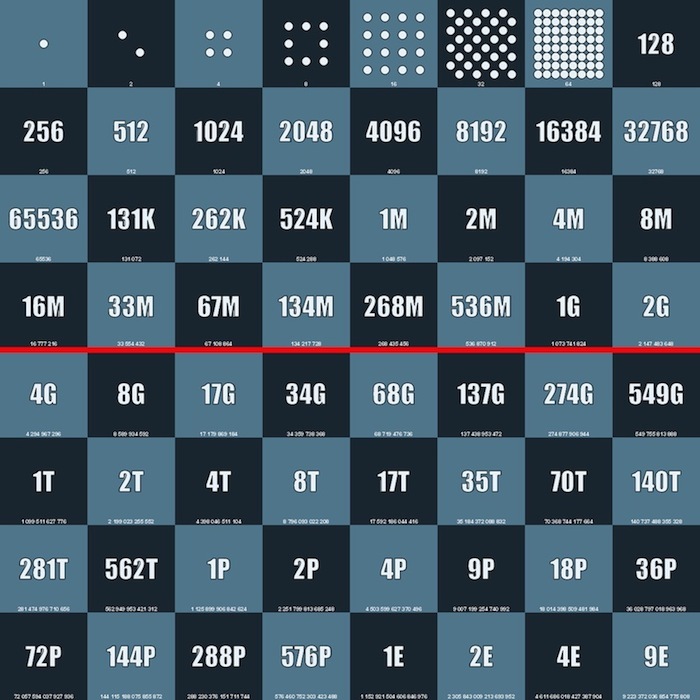 It goes on to the right with 2, 4, 8, 16... then numbers grow too big, we start to use the binary notation: K=kilo (1 thousand), M = Mega (1 million), G = Giga (1 billion), T = Tera (1 trillion), P = Peta (1 quadrillion), E = Exa (1 quintillion). Figure 1.2: On the left, at minute zero, there are no bacteria in the glass. On the right, after a certain amount of doublings, the bacteria filled the whole thing. But what happens at minute 55 (in the centre)? Sustainability 101: Arithmetic, Population, and Energy, Albert Bartlett. The reason is for this quite simple. 70 is approximately 100ln(2). So, doublingtime 100ln(2) 69:3. If you want the time to triple the formula is: triplingtime 100ln(3) 109:8. The time to grow n-times is 100ln(n). According to other accounts, it was a legendary Dravida Vellalar. Dravidian peoples is a term used to refer to the diverse groups of people who natively speak languages belonging to the Dravidian language family. Populations of speakers of around 220 million are found mostly in Southern India. Vellalars (also, Velalars, Vellalas) were, originally, an elite caste of Tamil agricultural landlords in Tamil Nadu, Kerala states in India and in neighbouring Sri Lanka; they were the nobility, aristocracy of the ancient Tamil order (Chera/Chola/Pandya/Sangam era) and had close relations with the different royal dynasties named Sessa or Sissa. There exist many different variation of the same story, one set in the Roman Empire involving a brave general and his Cæsar, another with two merchants at the market, all different situations producing the same result. The Robots Will Steal Your Job, But That's OK Audiobook is released under a Creative Commons — Attribution-NonCommercial-ShareAlike 3.0 Unported license. Feel free to use any or all of it as long as you link back to http://thenexus.tv/rsj3, you do not use it for commercial purposes, and you release any derivative works under the same license.